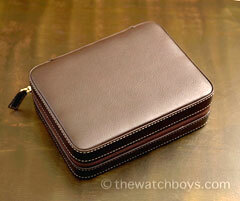 Quattro Watch Travel/Storage Case - Brown Leatherette [box_brn_leath_quattro] - $42.29 : The Watch Boys, Providing quality products for watch collectors! Case Details: For all watches with a maximum case diameter of approx. 52mm (including crown). Brown leatherette, with off-white interior, white stitch and zipper closure. Dimensions: Rectangular shape - Length 7" (18cm) x Width 5 1/2" (14cm) x Height 2 2/5" (6cm). Sturdy shell protects 4 watches that have a strap or bracelet.